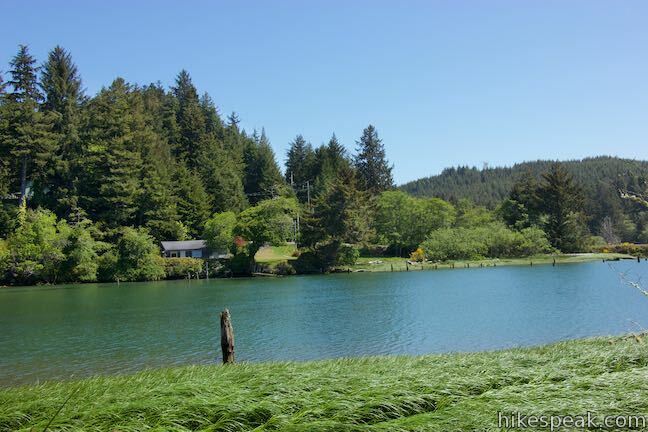 Just south of Lincoln City on the Oregon coast, Highway 101 crosses the Siletz River as it flows into Siletz Bay and the Pacific Ocean. 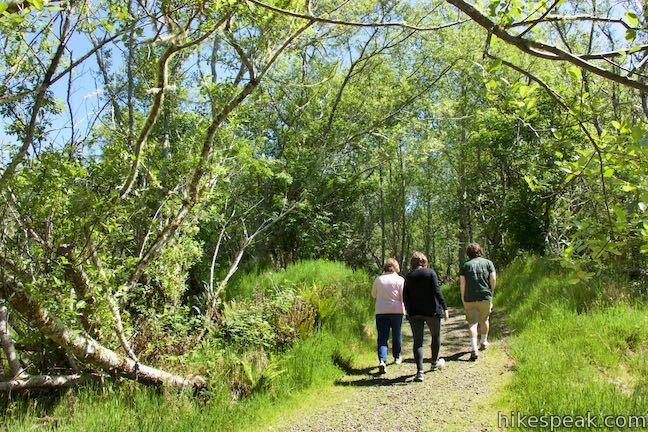 It is at this location that you will find Alder Island Nature Trail, which opened in 2017 and offers a level 0.85-mile loop hike around an island between the river and its marshes. 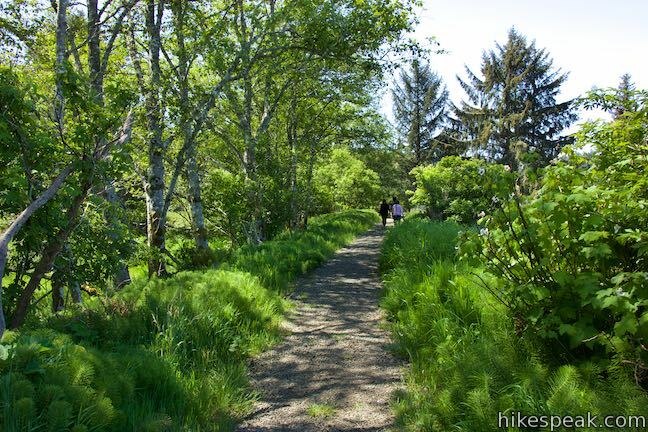 While it might lack the ocean views of surrounding coastal hikes, Alder Island Nature Trail is a tranquil spot for a short, easy outing with wildlife-viewing opportunities. 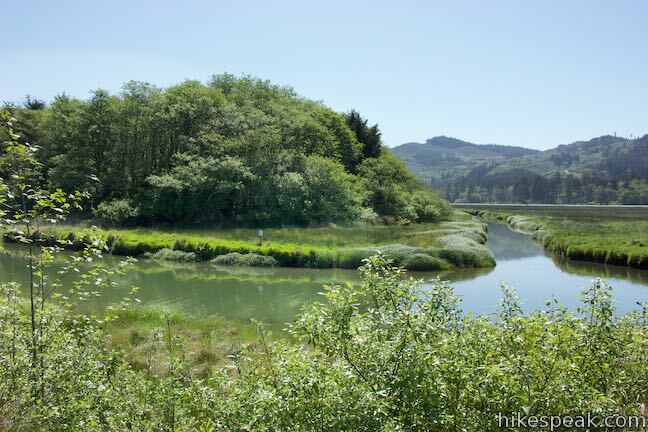 Set out from a trailhead parking area for Siletz Bay National Wildlife Refuge, located just off Highway 101. 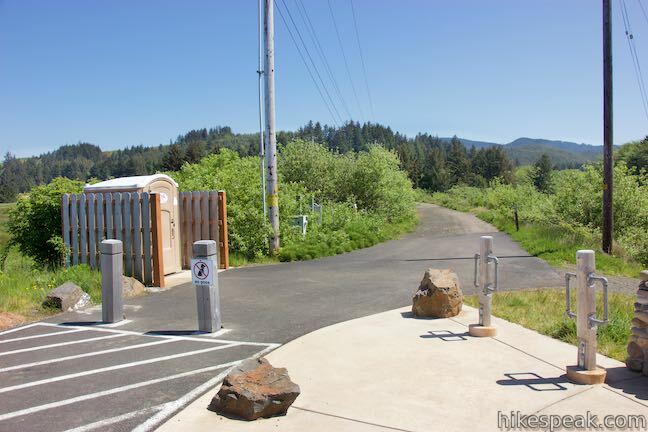 From the trail kiosk, set out northeast on the paved service road extending off the end of Millport Slough Lane. 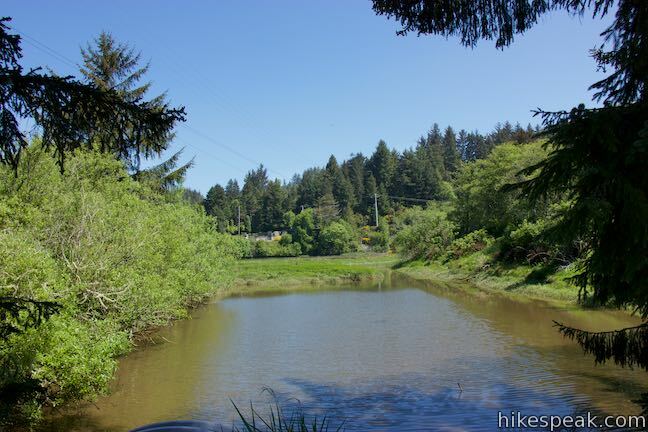 Enjoy views east over wetlands along the Siletz River. Canoes and kayaks (and other non-motorized boats) are welcome to explore the refuge too, using a boat launch near the trailhead. 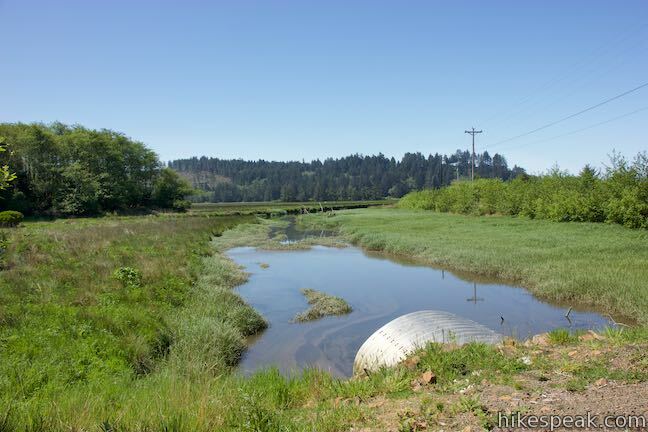 Tidal flows along portions of Siletz Bay were once diked to provide pasture for cattle. 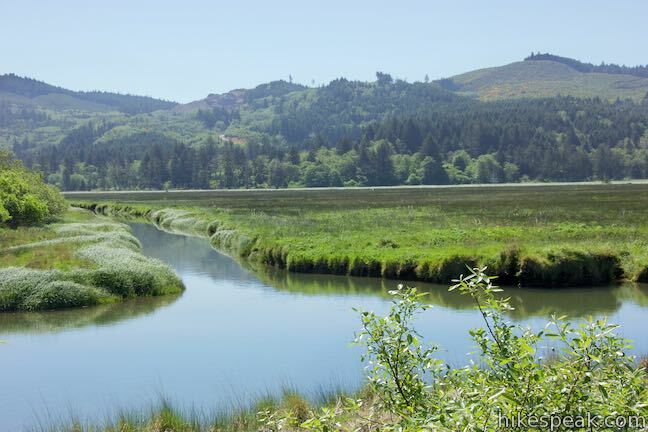 Now river and seawater meet and mingle once again, thanks to restoration by the U.S. Fish and Wildlife Service and its partners. The mix of freshwater and saltwater draws multitudes of anadromous fish, ducks, shorebirds, herons, eagles, and cormorants. (Anadromous fish are those that travel up rivers from the ocean to spawn.) Alder Island also has a unique development history. 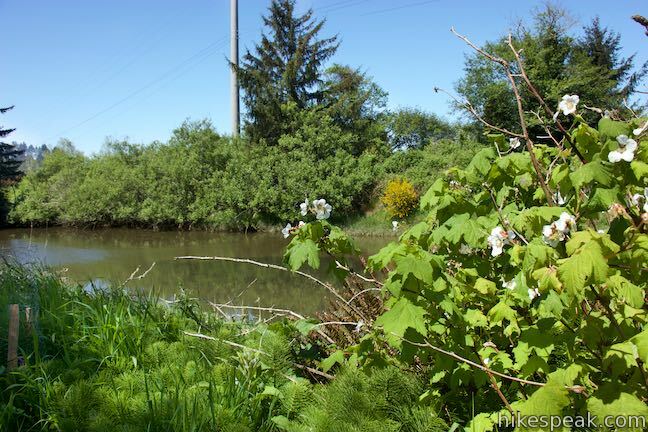 A nearby housing construction project dumped dirt from a dredging operation onto the island, raising Alder Island above the tides and allowing alder trees to take root. The island’s man-made height was retained during the refuge rehabilitation so that the island could host a hiking trail. Approach the end of the pavement, around 0.15 miles from the trailhead. 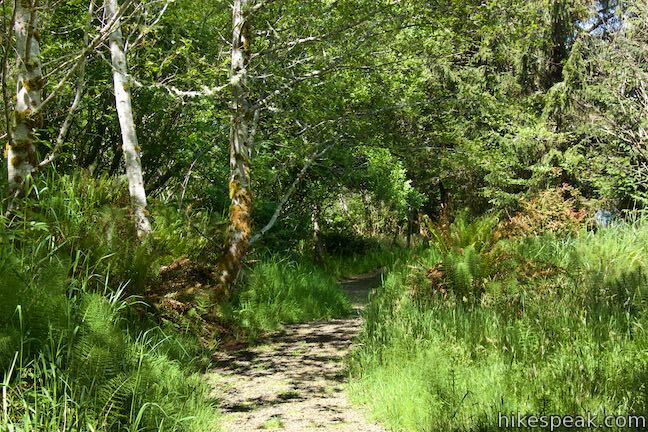 Bear right onto a gravel path, Alder Island Nature Trail. Cross a land-bridge over the channel along the west edge of Alder Island. On the other side, come to a marked trail junction where the loop begins. 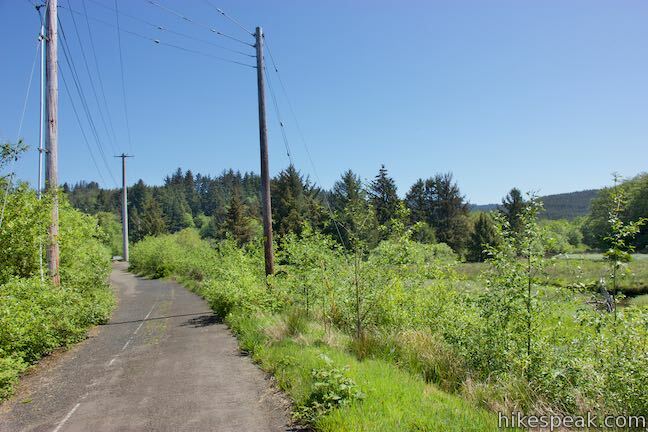 To the left, the trail angles toward Siletz River. 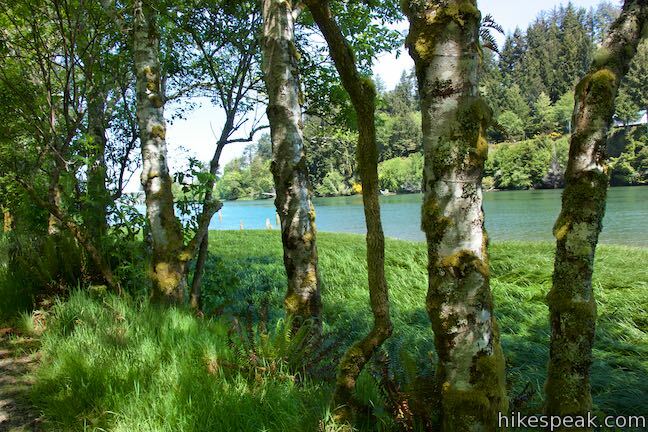 For now, continue straight ahead and save the sights of the river for the second half of the hike (unless you prefer to hike in a clockwise direction instead). 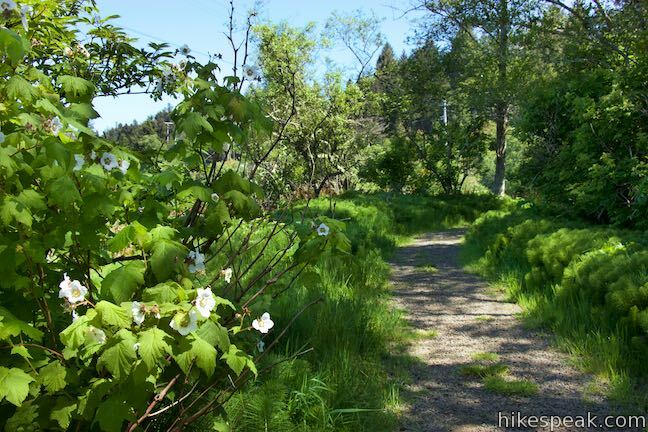 Alder Island Nature Trail proceeds along a channel the flows beside the island. 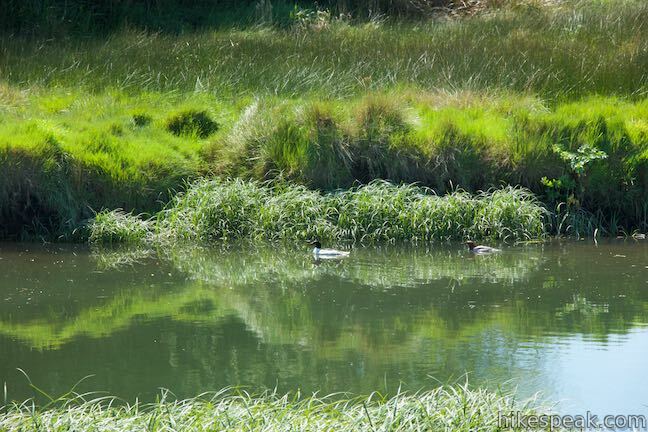 Keep an eye on the banks to spot herons, egrets, and ducks. Pine-covered hills rise beyond the wetlands. 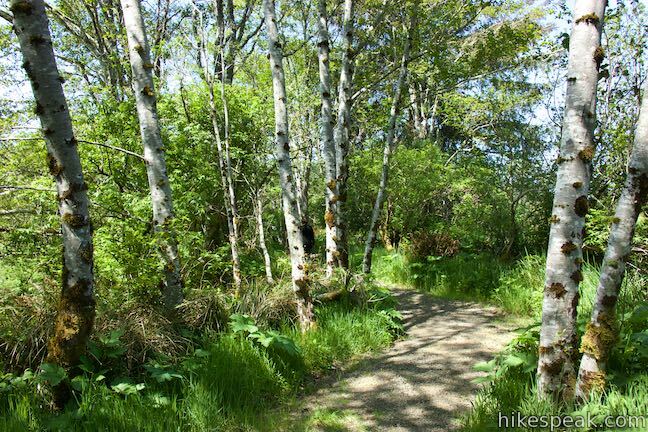 The trail weaves through stands of alders that do more than give this island its name, presenting hikers with pleasant partial shade. 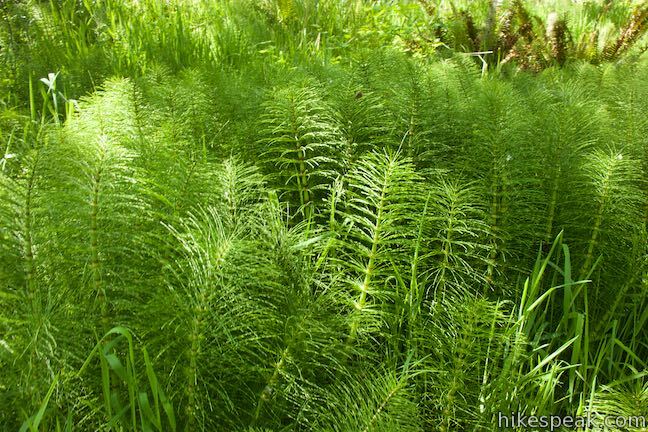 Horsetail, ferns, and grasses soak up the speckled sunlight that reaches the ground. 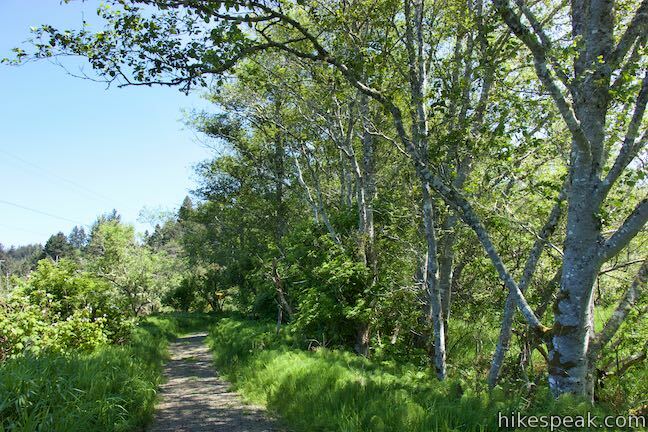 After 0.4 miles of hiking, reach the east end of the island, where the trail makes a sharp right turn. 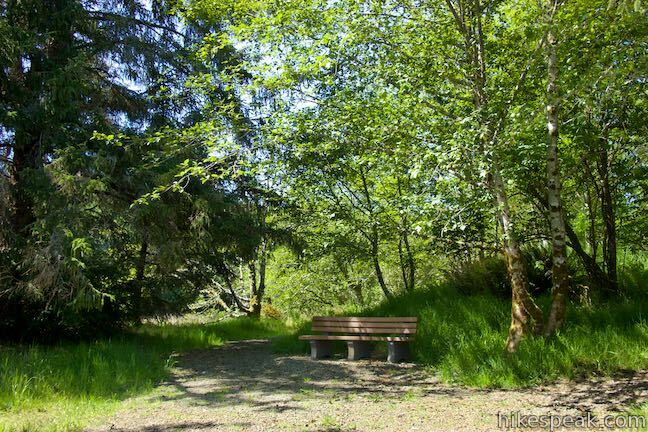 A bench positioned here offers nice views looking up and across the Siletz River. 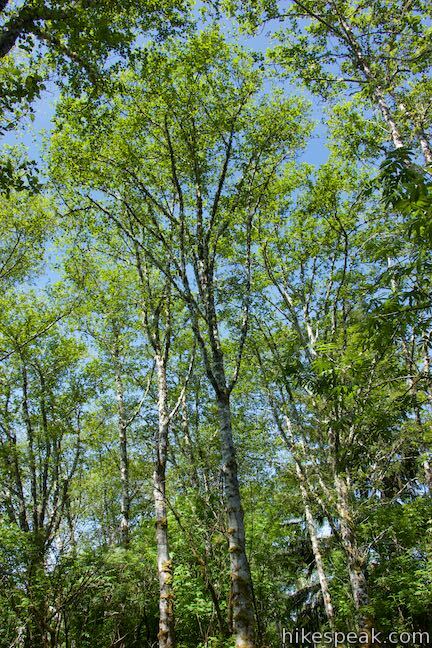 Have a seat and listed to songbirds in the trees. 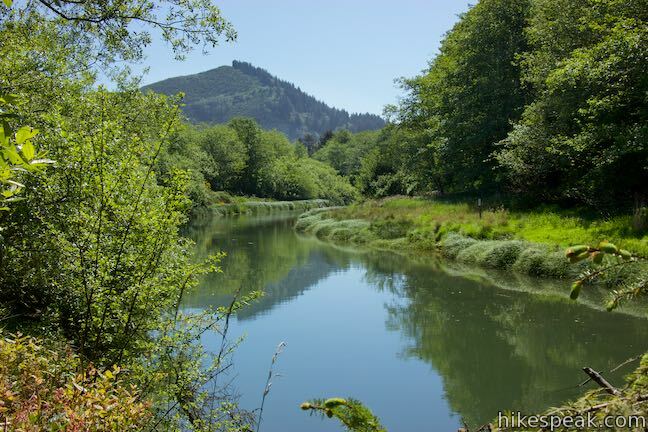 Step up to the shoreline to broaden your perspectives of the river. 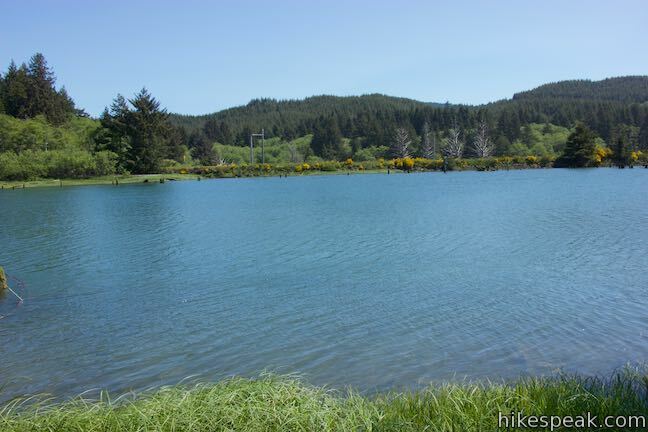 The shore here may also serve as an access point for anglers. Continue on the trail across the north side of the island. 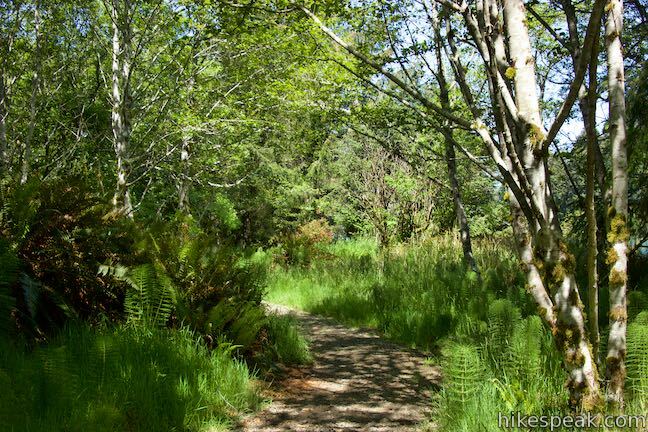 Over the second half of the loop, river views are abundant from the edge of the island’s forest. Eventually, the trail curves away from the river and borders a channel flowing along the island. 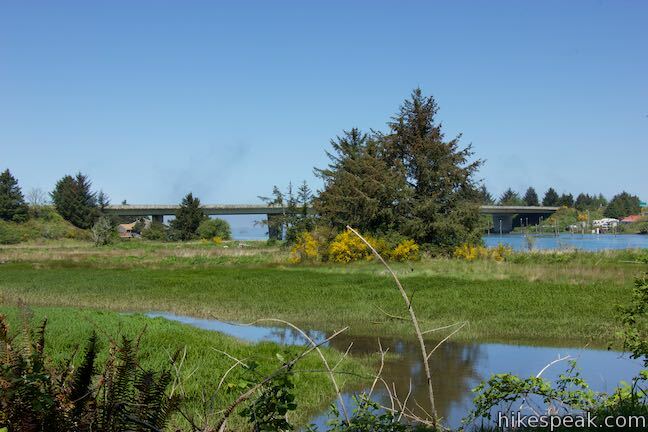 Gaze down the Siletz River toward a bridge on Highway 101, backed by Siletz Bay. Walk along the channel back to the junction where the loop began. 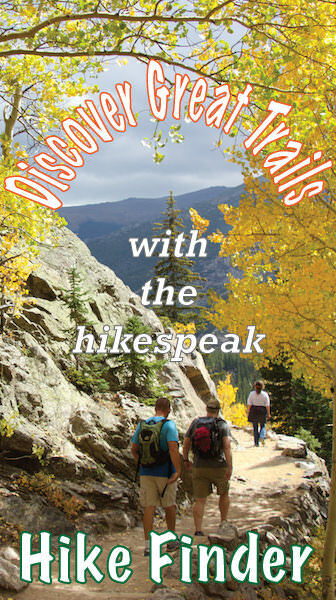 Having hiked 2/3 of a mile, it is now a short walk back to the trailhead. Bear right, leave the island, and turn left when you hit the pavement to return to your vehicle. 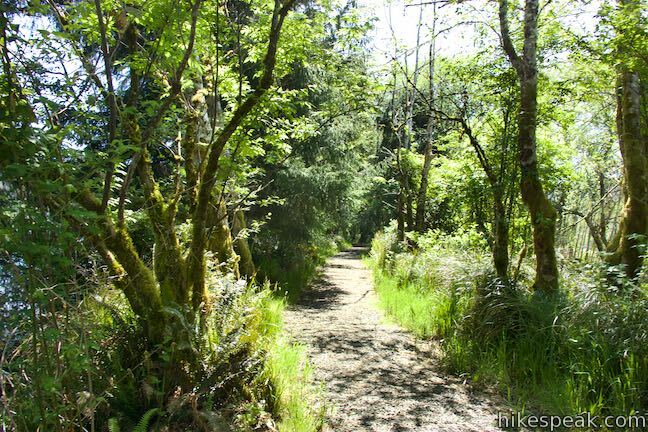 With just a few feet of elevation change along this 0.85-mile loop, you’re unlikely to find an easier hike along the Oregon coast between Lincoln City and Depot Bay. 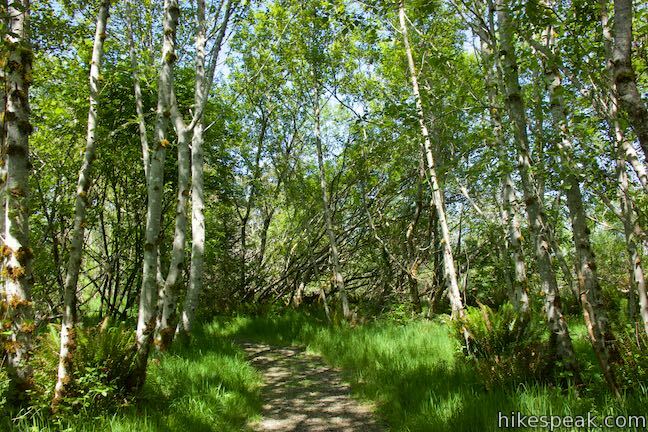 Put some coffee or tea in the thermos and enjoy a stroll on Alder Island! 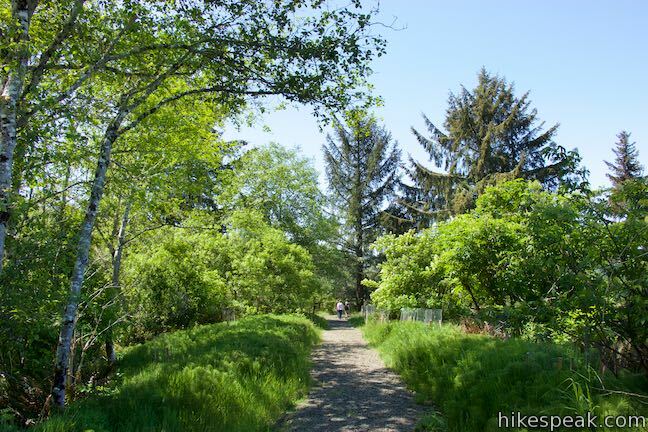 Dogs and bikes are not allowed on Alder Island Nature Trail. 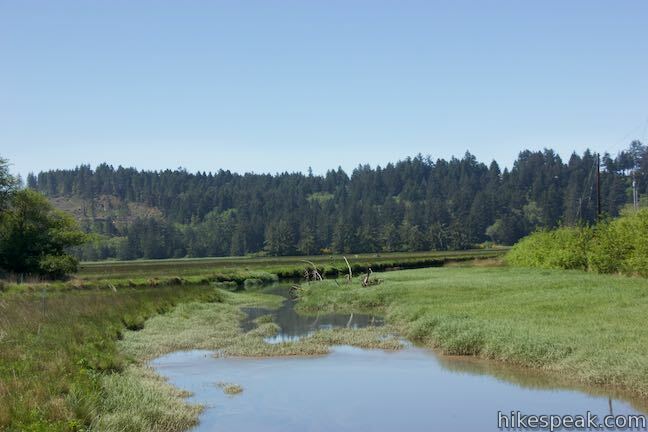 No fee or permit is required for this hike in Siletz Bay National Wildlife Refuge, so get out and enjoy! 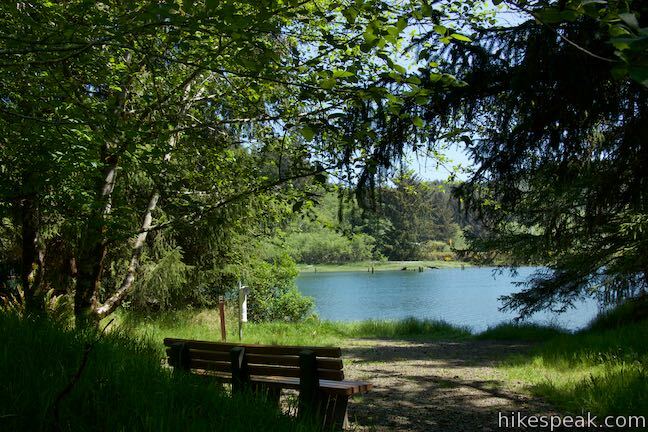 To get to the trailhead: From Lincoln City, take Highway 101 south for 5 miles. 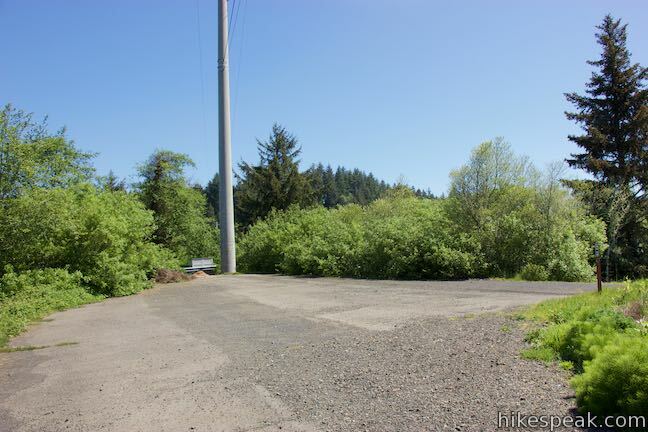 Pass Route 229 on the left and drive another half mile, crossing over the Siletz River. 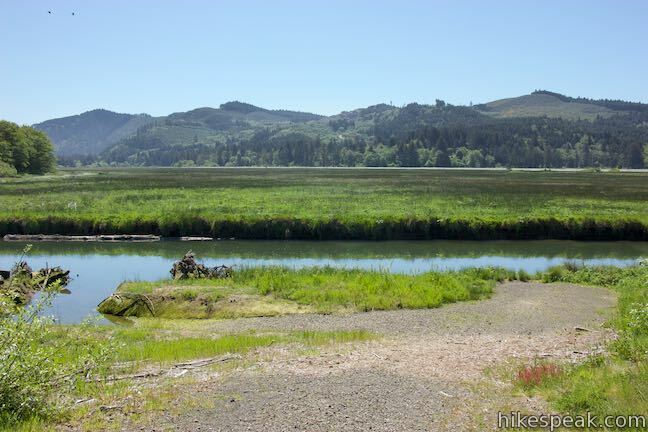 Turn left onto Millport Slough Lane, following signs for Siletz Bay National Wildlife Refuge. Drive a hundred yards to the trailhead parking area. 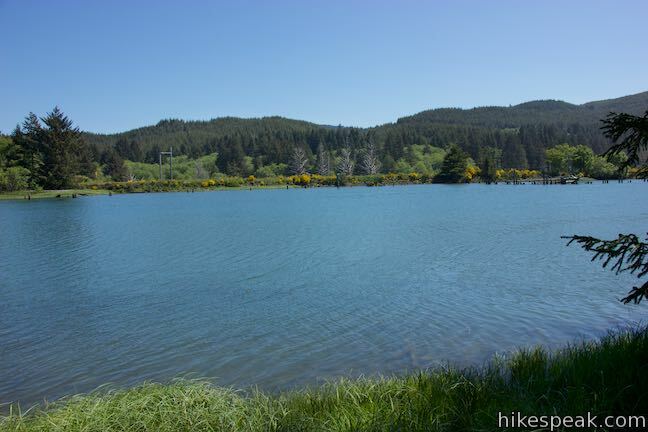 Coming from Depoe Bay, drive 7 miles north on Highway 101. 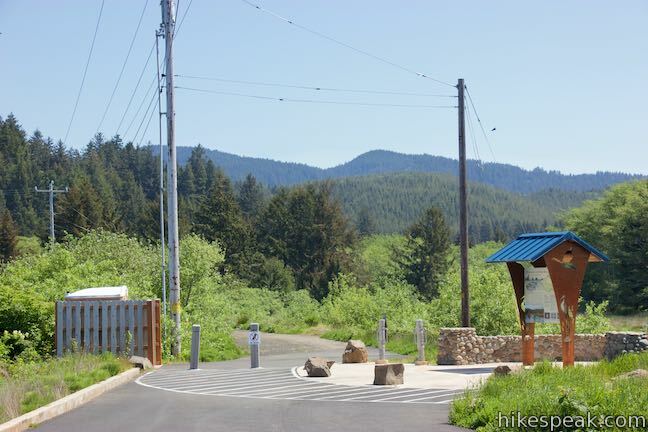 After Siletz Bay appears, turn right onto Millport Slough Lane and park near the trailhead at road’s end. An intersection on the right side of Highway 101 with Immonen Road comes half a mile before Millport Slough Lane. These photos were taken in May of 2018. Click to enlarge.